What’s Your Wedding Dress Personality? It’s that time of year again — wedding season. If you’re not planning your own wedding, you probably have one or 11 already on your summer calendar. I have three very different weddings this year and I’m looking forward to each and every one. I enjoy seeing how two people put their unique stamp on the event. As for the bride, I’m always excited to see a friend glowing on her special day. 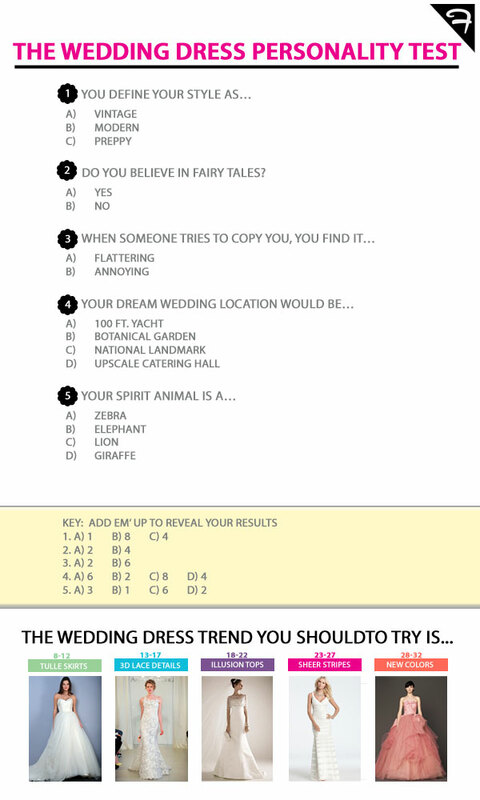 If you’re in the market for a wedding dress, or simply a sucker for a beautiful gown, take our wedding dress personality test! You’re a romantic who values tradition. You have never been to a wedding that didn’t make you cry. You’re seeking a dramatic dress that will flatter your body and inspire awe in your guests. You can’t resist an old Hollywood romance. Your favorite movies include “An Affair To Remember,” “Roman Holiday,” and “Casablanca.” You’re seeking a wedding dress that is both simple and glamorous. You believe love is magical and no one can deny how blissed out you are. When you’re happy, you can’t help but smile. You want a dress to reflect how you feel, like you are soaring on cloud nine. Your friends describe you as practical yet chic. You feel your wedding dress should reflect your unique personal style. Your outgoing nature cannot be contained! You’re the type of individual who shines in the spotlight. You want a wedding dress that reflects your creativity. Home » Mind & Body » What’s Your Wedding Dress Personality?